This afternoon, I would first like to express our gratitude to the churches of Lebanon and the Middle East Council of Churches for their invitation and their welcome. This meeting in Beirut is the fruit of the commitment of all their leaders and also the work of many volunteers. To all of them, a huge thank you! These days we will experience the warmth of Eastern hospitality. 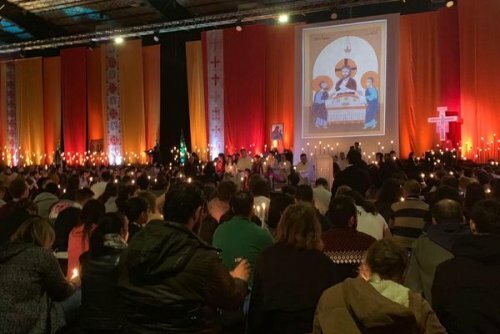 It is a great joy that we are all together here for this first gathering of Taizé in the Middle East, in this beloved country and this blessed land. We are together these days first of all to listen to one another. With the hundreds of young people from Europe and elsewhere who have traveled so far, we would like to be inspired by the example of the centuries-old tradition that Christians of the Near East represent in their great diversity. This image of the cedar of Lebanon touches me all the more because, for some time now, two cedars have been growing in Taizé, not far from the place dedicated to silence: although still small, these trees are like a discreet but real link between Taizé and this land of Lebanon. These days, we would like to go to the sources of faith: rooting ourselves in faith and in history, being attentive to spiritual growth and looking to open the branches of our tree to all those around us. May this meeting in Beirut be a time of joy and a sign of peace! Tonight, I would like to express once again our immense gratitude to the leaders of the churches of Lebanon and of the Middle East Council of Churches, the parishes and host communities who have been preparing this meeting for many months. The ecumenical committee that prepared the meeting has done a remarkable job. The volunteers were divided into working groups that were all marked by great diversity: Christians from all the churches worked together. Yes, this first Taizé meeting in the Arab world has been made possible by the blessing of the churches, by the support of the civil authorities, the commitment of young volunteers and also the trust of those who are welcoming us... without knowing us. After this first day, you head back to the families, communities and convents that are welcoming you. Let us rejoice that doors are opening to welcome us! It is essential, in our societies often marked by a growing mistrust, that we have a simple experience of trust. These days, we are gathered to listen to one another. All of us have both something to receive and something to give. We brothers, with the hundreds of young people from Europe and elsewhere, would especially like to listen to the young people who have come from this Middle Eastern land which is blessed and yet which is so familiar with suffering. I am thinking in particular of the young people who are among us from different countries in the Middle East. We are waiting for these days to enable us to live an in-depth exchange between the West and the Arab world, so essential for the future of the Church and of humanity. This meeting was preceded by visits made by several brothers in this region and by the pilgrimage in Egypt, in September 2017, to Coptic Orthodox. Personally, I have a powerful memory of my previous stay in Lebanon three years ago, from where I also went to Syria, to Homs and Latakia, to celebrate Christmas in that country which was torn apart. In this whole region, Christians are witnesses to a long tradition of faith. The multi-secular history of the Church continues to be written today. While in the past, Christian divisions have often been a heavy burden, now we are discovering all the ways that we can live together, precisely in the name of our faith. This morning, in the small sharing-groups, you reflected on the theme of rootedness in the faith, among others using this verse of the prophet Jeremiah: “Blessed are those who trust in the Lord, whose trust is the Lord. They shall be like a tree planted by water, sending out its roots by the stream” (Jeremiah 17:7-8). This image of a tree planted near a stream of water seems to me very telling. Yes, we can always seek to root our trust in God more deeply, closer to the wellsprings of living water. To trust means counting on him, his unconditional love, his benevolent mercy. The text we heard tonight in prayer gives us another key to enter this mystery. In the parable of the sower, Jesus presents God as the one who sows generously, without being sure that every seed will bear fruit. God gives to all without measure and we are all invited to ask ourselves: how can we receive what God gives us? Especially in difficult times, marked by violence and war, by the grave threats weighing on the ecological balance of our planet, we discover more and more this impulse of life, sometimes unexpected, that God offers us. This parable also tells us how Christian hope touches the concrete aspects of life. When Jesus told it to his disciples, he himself was facing hostility and rejection. Yet he expressed his hope that some seeds would fall on good soil. The prayer will now continue around the cross. This is a prayer we have every week in Taizé. We are going to put down the cross close to the ground and everyone can come up to put his or her forehead on the wood of the cross. By praying in this way, we express to Christ that we entrust to him all that is too heavy for us, so that he carries it with us. Tonight we can pray especially for our families and loved ones, for those who are experiencing hardship. And we also pray for our respective countries. May the comforting Holy Spirit be a presence of hope. The hospitality received and shared these days will remain for all of us a very powerful memory of this meeting. Since some of those who have welcomed us are here tonight, we want to say a big thank you to them for this beautiful hospitality. It gladdens our hearts and does good to our bodies these days. To all our Lebanese friends who are present, I would like to say one thing in particular: a word of gratitude for their testimony of faith. The ties between Taizé and Lebanon go back a long way. Brother Roger came to Beirut in 1982, while the war was still taking its toll. And he announced a very important initiative during that visit: it was in Lebanon, at Christmas 1982, with young people from Beirut, that he began a “worldwide pilgrimage of reconciliation” which would later take the name of “pilgrimage of trust.” This pilgrimage continues until today, punctuated by the meetings we are preparing on different continents. Yes, a big thank you from the bottom of my heart to all of you, dear friends from Lebanon. Thank you for putting your faith into practice in today’s world and in this land of the Middle East, so often torn by conflict. Thank you for entering into dialogue with the believers of Islam: we will have such a dialogue tomorrow at noon on the occasion of March 25, around the figure of Mary who is a bridge between Christianity and Islam. For this growth of faith to take place, it seems to me essential to walk together with others. Just as a toddler needs love and affection to grow in life, so every believer needs a family, a community, to grow in faith. This is the wonderful gift we receive in the Church: it is called communion. This gift of communion concerns both the relationships between the members of the Body of Christ, but also, more broadly, the desire for the visible unity of the Church. To seek unity means first of all to let Christ have the first place—he is the one who brings us together. Christ already unites us: it is up to us to do all we can to reveal this unity, already accomplished, mysteriously, in the heart of God. Throughout the year 2019, in the international meetings in Taizé, we are deepening the theme of hospitality. I would like to say a few words about hospitality this evening, because I think that there is a deep link between it and spiritual growth. Before being a call to generosity towards the stranger or the one who knocks on our door, hospitality is part of God’s own identity. Indeed, God himself is the source of hospitality: he welcomes us all, without any preconditions; he desires our happiness. Moreover, through Christ, God has gone so far as to become one of us, to bring and welcome humanity to him. If God gives us this gift of his hospitality, our free response is necessary so that we can experience a true communion with him. Humbly, Christ stands at our door and knocks. As a poor man, he hopes and waits for our hospitality in return. If someone opens the door for him, he will enter. For us Christians, it is first of all through the face and the message of Christ that we know that God is love: he offers us his friendship. By a simple prayer, we give him access to our heart. So, even when we feel very little of his presence, Christ comes to dwell in us. To welcome him, we do not need much. Even though our prayer is very poor, he comes to us through the Holy Spirit. To this simplicity in prayer corresponds a simplicity of life. To witness the Gospel, an abundance of possessions can sometimes become an obstacle. When we make do with very little, when we choose to simplify our way of life as much as possible, it is as if the Gospel could shine out better through us. And what is true in each of our lives is also true in the life of the Church. Yes, let us rejoice these days that, even with our empty hands and our faith that is sometimes so little, God makes the seed grow, as on fertile ground. As we did last night, we will continue to sing and pray around the cross. Through this prayer, we experience very concretely how, in our great diversity, Christ already unites us. Yes, he opened his arms to the entire universe to reveal to us the love of God. And this prayer allows us to think not only of our own burdens, but also of all those who are undergoing hardship in their lives: those who suffer in their souls or bodies, those who have had to leave their country, the victims of injustices of all kinds, those who experience loneliness. As Jesus said to those who followed him, “Come to me, you who are overburdened, and I will give you rest.” Through his life, his death and his resurrection, Christ has opened for each and every one of us a way of life. “Salam aleikhum!” Peace be with you! May this greeting be exchanged between us as a wish for mutual blessing. Yes, it is a great blessing to be together on this day of March 25 when Christians and Muslims celebrate Mary together here in Lebanon. For both, Mary is an example of a believer. With confidence, Mary surrendered herself to the will of God. From her, we can learn in our turn this attitude of surrender to God. I would like to say to our Muslim friends here today how much I admire, in their great spiritual tradition, this thirst for surrendering to God. In recent years, we have been deepening in Taizé a dialogue of friendship between Muslims and Christians. For us, it is in the very name of our faith that we wish to enter into this dialogue. Indeed, we see in the Gospel how Jesus went beyond the cultural, social and religious barriers of his time to enter into relationships with people who were not his people, who did not share his faith. How can we adopt in our turn this attitude of profound openness that we see at work in the life of Jesus? First of all, I believe, through a fulfilled inner life we can receive without fear the difference of others, their otherness, in an open-hearted trust. The fruit of this inner attitude is found in an authentic fraternity with those around us. For several decades now, brothers in our community have been living this friendship in small groups on different continents. In Bangladesh and Senegal, in neighborhoods where the population is predominantly Muslim, they have formed real bonds of friendship. If we speak of fraternity, it is also because we believe that God is a father to all human beings. And for us Christians, it is through the life, death and resurrection of Jesus that we discover this unconditional love of God. Allowing fraternity and friendship to grow implies respecting others in their difference. In any genuine inter-religious dialogue, an attitude of respect should keep us from wanting to force the other person to think as we do. True friendship is possible with people who think very differently, even on essential topics! Of course, this friendship also involves, without a doubt, an element of suffering, because the treasure of my faith can not be fully received and shared by the other. What for me is the source of a deep joy can even remain inaccessible to the other person. That should not keep us from entering into dialogue! Even with these mysterious limits, we are always called to love and respect others as they are, to strive to know better what they believe and the source of their life. At this time when our world is often shaken by violent events, it is fundamental to do everything to express that religions do not want violence but seek to be factors of peace, friendship, and fraternity among all human beings. My wish is that this day celebrated together may allow all of us to know a widening of the heart. Yes, let us welcome each other, let us let others welcome us—the person who stands in front of me, the stranger, the one who is different from me. Thanks to our meeting and to the beautiful welcome in Beirut these days, we experience that we are one human family. Tonight is already the last common prayer of our beautiful meeting in Beirut. Once again, I would like to express our deep gratitude to all those who made this meeting possible, especially to those in charge of the various Patriarchates and the Middle East Council of Churches. Our deepest thanks to the families and religious communities who have hosted the young people, to the many volunteers who worked tirelessly, to the steering and executive committees and all the different teams that thought of all the details. I don’t know how to express how moved I am to see all of you gathered here, coming from so many countries to Lebanon. From now on we will feel even closer to Lebanon and the Middle East, in particular close to the young people from Palestine and the Holy Land, to those who have come from Syria, Irak, Iran, Jordan and Egypt. Heartfelt thanks to all of you: Choukrane jazilan ! The third part of our reflection of these days has been deepened today, in the small groups this morning and in the workshops this afternoon. This is the reality that we see at work in the growth of the cedar branches: they develop so to speak laterally, towards others. How can we accomplish this opening in our everyday life? Who should we open ourselves to? The inter-religious meeting this afternoon gave us an opportunity. Really, we lose nothing of our identity in genuine dialogue with believers of other religions, if our faith is itself deeply rooted! Can I share with you an experience of this kind that is taking place in Taizé? For many years now, we have been welcoming migrants, refugees from various countries in the Middle East, and also from Sudan, Eritrea and Afghanistan. Many of these exiles are Muslim. Over time, a deep friendship has developed between us. And our view of others changes when we come into contact, very concretely, with people from elsewhere. In the text we heard tonight, we can find an example of this attitude in the life of Jesus himself. The scene occurs in Tyre and Sidon, in this Lebanese land where we are gathered. It is an amazing encounter between Jesus and a Canaanite woman, who is introduced by St. Mark as coming from Phoenicia, the ancient name of Lebanon. When this woman comes to ask Jesus to cure her daughter, at first he does not answer her. The answer he then gives seems rather scornful for a non-Jew: “It is not good to take the children’s bread and throw it to the little dogs.” This reminds us that Jesus’ first mission was to the Jewish people, long before his disciples were given the mission to announce the good news to all nations. Then comes the surprising remark of Jesus, which marks a real reversal: “Woman, your faith is great! May it happen to you as you wish.” As a result of this personal encounter, Jesus went from a distant expression to an attitude of respect and hospitality. It is as if the woman had counted on what was truest in Jesus, as if she had mysteriously grasped the universal character of his mission among us. Yes, to let ourselves be surprised by God and to discover friendships that stimulate us, let us dare, as Jesus did, to welcome others in their difference! To take such a radical step forward, personal meetings are essential. It seems to me that this is also the goal of our “pilgrimage of trust”: it would like to offer platforms for dialogue and encounter. This pilgrimage will continue in various places in the coming months. You are most welcome to come to Taizé during the summer and throughout the year. From August 25 to September 1, a special week of reflection will bring together young people from 18 to 35 years old, with this year a special program on the safeguarding of Creation. It will be preceded by a weekend of friendship between young Christians and Muslims, from August 22 to 25. In September, the next African youth meeting will be held in Cape Town in South Africa, followed by a European meeting in Poland, as at the end of each year. At the end of our meeting in Beirut, let us ask ourselves: these days, what have we better understood of the Gospel? We can put the little we have grasped into practice without delay, with our limited means, and already our existence will be transformed. May each and every one of you have a good journey, and let us repeat between us the greeting of peace that we have heard these days: ‘Peace be with you!”. And may this peace continue to shine out from our hearts.